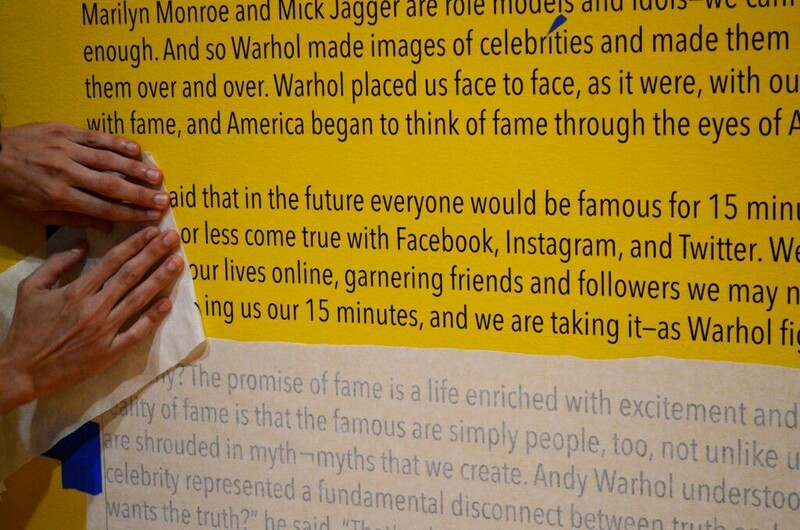 How often do we really consider the work it takes to put together a huge art exhibition at the Columbia Museum of Art, like Marilyn to Mao: Andy Warhol’s Famous Faces? Chances are, not often. And that’s how the curatorial staff at the Columbia Museum of Art wants it. Everyone on staff works hard to ensure that visitors to the museum only see the art, and are not distracted by wall color, a misplaced light, or a crooked art piece. It sounds simple enough, but months of planning, calculations, and tedious and hard physical labor go into every exhibition. At Jasper, we wanted to shine a light into the dark recesses of the curatorial department (housed in the sprawling basement of the CMA), where few are allowed without the proper credentials, and expose to the public this incredibly hard-working and skillful staff. 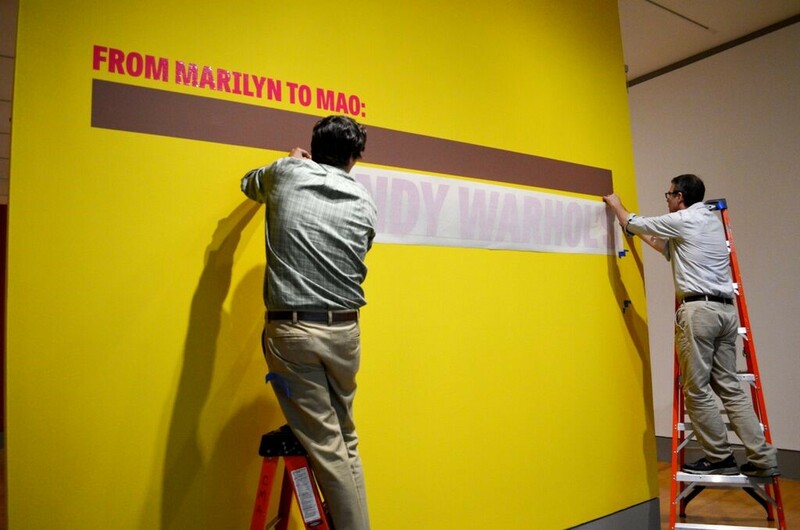 Exhibition Designer and Preparator Michael Dwyer is our guide behind the scenes, walking us through the conception of Marilyn to Mao, to its installation and unveiling. 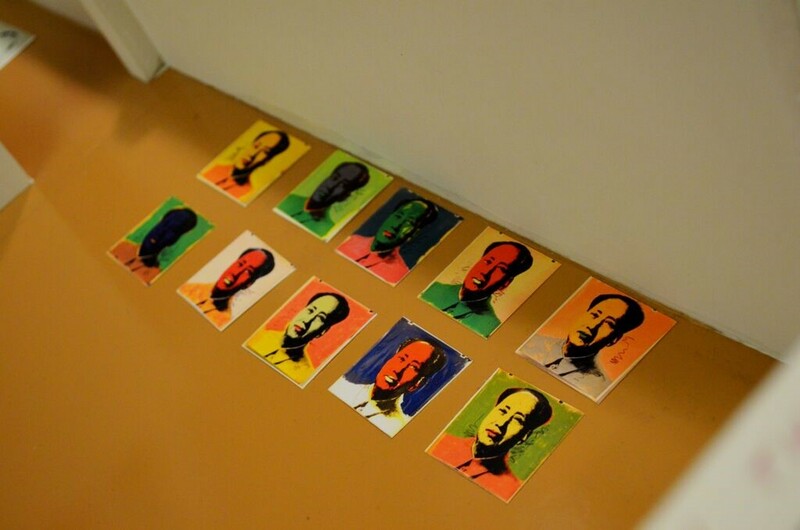 The CMA was the recent recipient of a generous, anonymous gift of the Mao suite, a series of ten Warhol screenprints from 1972, depicting the chairman of the Communist Party of China, Mao Zedong. This is a pretty big deal, as a series of prints are often split up. It’s a rare and wonderful thing to receive a full suite like this one; and Will South, Chief Curator at the museum, immediately began planning an exhibition to showcase the museum’s gift about a year in advance of the June 2015 opening. 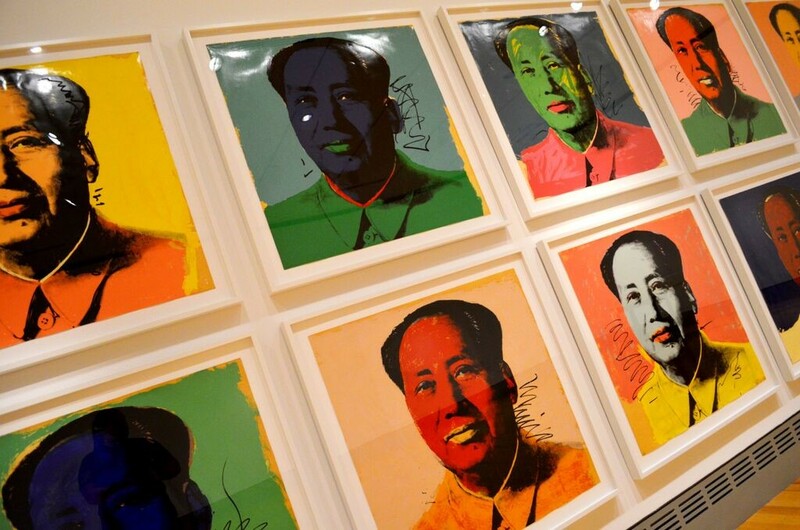 As South was securing artwork from lenders for the exhibition (in this case, The Andy Warhol Museum in Pittsburgh, Pennsylvania, and the Bank of America), the Mao suite was in the hands of the conservators. 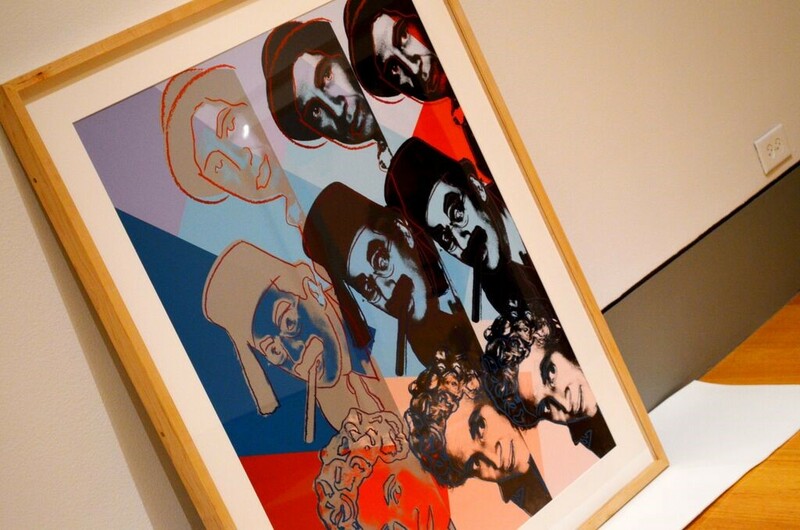 Apparently, as Dwyer explained, Warhol wasn’t particularly concerned with the long-term stability of some of his prints, and some minor repairs had to be made to get the pieces exhibition ready. Dwyer explains, you never know what you’re going to get when you open up an old frame—he’s found everything from coffee stains to cardboard backing, which contains acid and can discolor and eat away at the artwork over time. 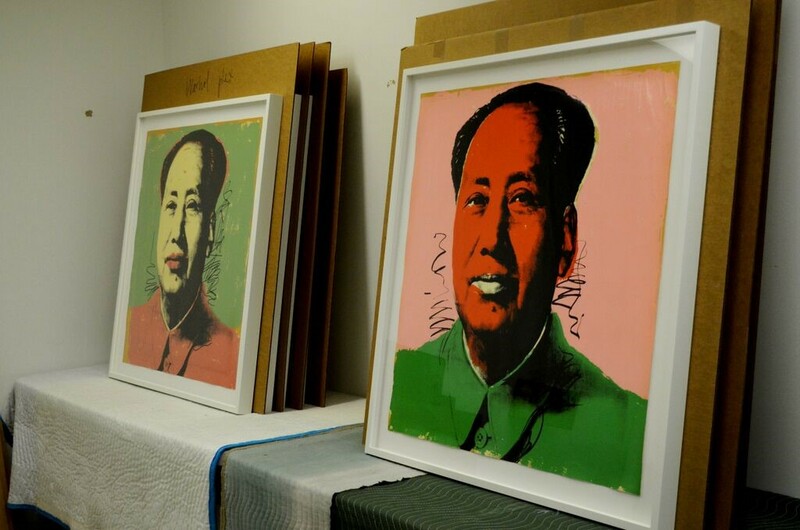 After getting the Mao suite from the conservators, Dwyer and Richardson set to work framing the 10 pieces. 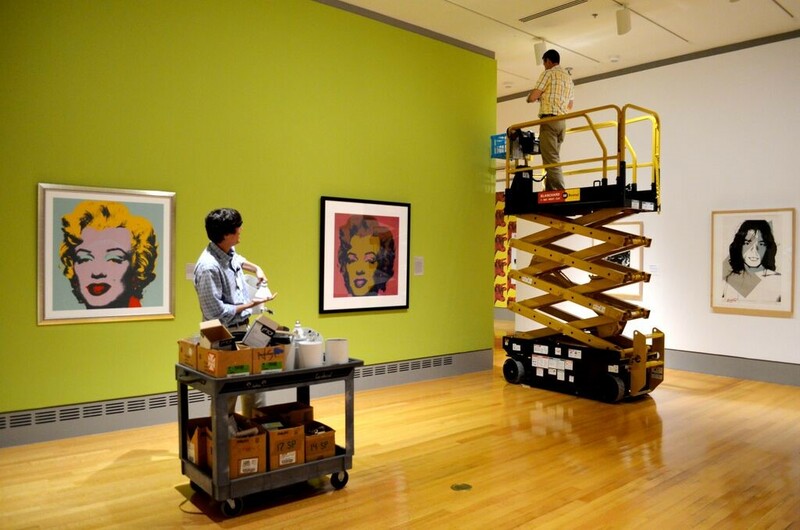 A new way of mounting the art work had to be devised, as the paper Warhol used did not stand up to water-based adhesives typically utilized for this process. Dwyer described a tedious process of heat-setting tabs onto the back of the prints, and cutting dozens upon dozens of slits into the backing for these tabs to slip into. Each print took a full work day to mount and frame. After South secured the lenders, Dwyer received small thumbnail images of the art work, created by Richardson, that are to be included in the exhibition. 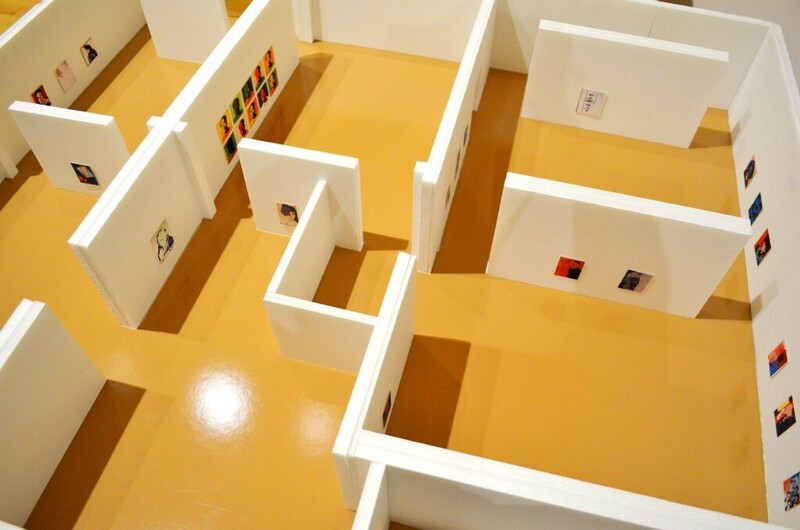 Each thumbnail was scaled down, painstakingly cut out, and South used a scale model of the galleries to arrange the artwork, designing and ensuring visual flow from one artwork to the next. From this point, Dwyer began picking out colors for accent walls within the galleries. These are walls that add a punch of color to the gallery setting, and showcase a particular work of art. Imagine trying to pick the perfect color based on an inch square photograph of a work of art you haven’t seen in person, and you’ll understand what a difficult task it can be. As aesthetic choices were being made by South and Dwyer, South also began writing copy for information panels which educate the viewer on the nature of the artwork, collection and artist. CMA’s Registrar, Amber Schneider, was working out the nitty-gritty with the lenders and contracts, and all the staff prepared for delivery of the lenders’ artwork. A few weeks before the public opening, the Warhol works arrived from their lenders, where the Curatorial staff finally sees the work in person. 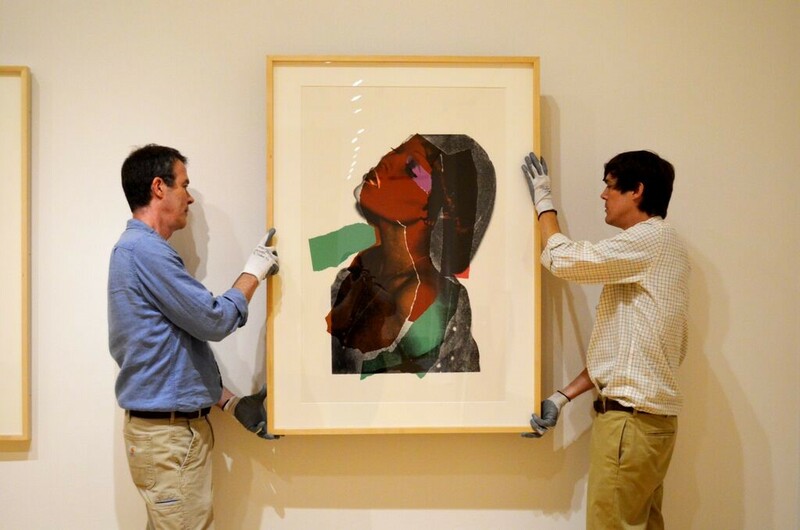 The work is carefully uncrated (a strenuous job made easier, or harder, depending on how well the artwork is packed), meticulously inspected and cataloged by Schneider and Curatorial Assistant Noelle Rice, and if need be, prepared for hanging by Dwyer and Richardson. 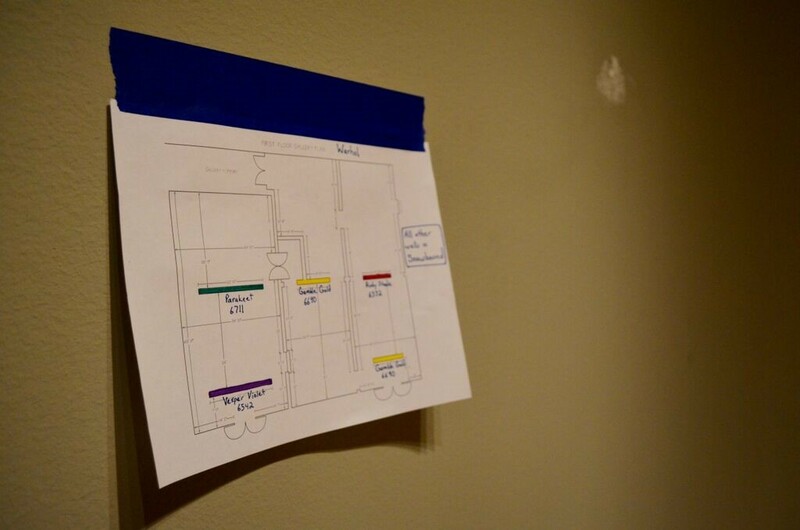 The wall colors, including the accent walls, are marked for the painters, and painting began; and artwork was laid out in the galleries ready to be hung. Dwyer and Richardson measured and hung the work so that the center of each piece is 59” from the gallery floor. This ensured an even and level gaze for the viewer, and creates a “visual quietness,” as Dwyer explains it, in the galleries. Text came next, and everything from labels, text panels, and the title wall were all written by South, formatted and proof-read by Rice, and carefully installed by Dwyer and Richardson. The paint and the vinyl text are specifically formulated for each other, otherwise, the vinyl will peel off. This discovery was made when paint manufacturers switched to low VOC formulas, and museums across the country began finding their vinyl on the floor after installation. Now, Dwyer says, it definitely sticks, however scrapping the vinyl off the walls after an exhibition comes down, takes several hours for a just a small block of text. The finishing touch was completed just hours before the public opening, by changing out bulbs and adjusting the lighting in the galleries. This in itself is an art-form, as the works should be well-lit but without glare or dark spots. It’s fine line to walk, Dwyer explains, as too much light can damage the prints, and the museum wants to ensure these pieces are around for future generations. With no time left to spare, the curatorial staff pulled together another high-quality, and impeccably presented exhibition. 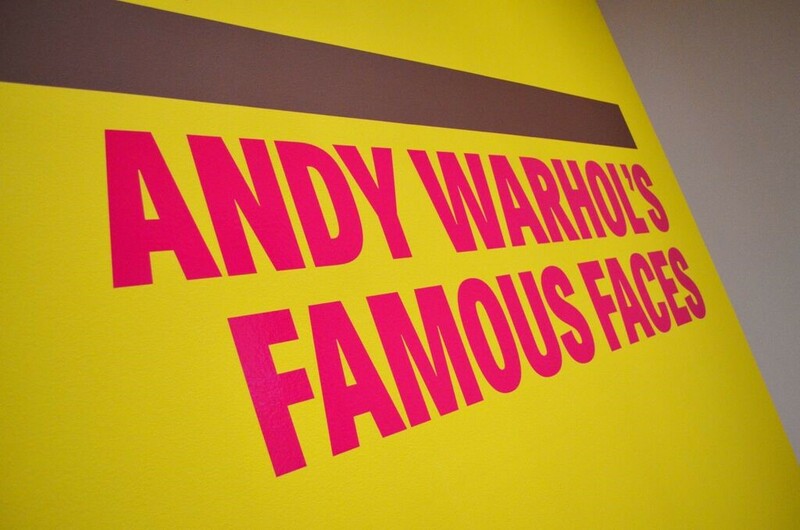 You can see their work on the Warhol exhibition, Marilyn to Mao: Andy Warhol’s Famous Faces, through September 13th. After appreciating the mad skills of curatorial department, spend some time with the art, as well!